Free Comic Book Day comes the first Saturday in May each year for the past fifteen years. It celebrates comics, comic culture, and fandom. It gives fans an opportunity to get out into the local comic book shops, get some free comics, and explore other great merch. I’ve never read the entire stack of free comics, so I thought…why not now? Could make a cool set of blog posts on this 365 quest. So here we are. 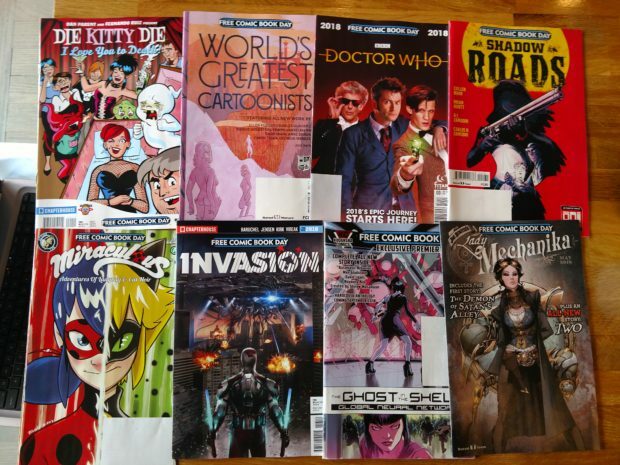 Each day this week I will be blogging on 7-8 singles issues that were distributed on FCBD. What am I going to be saying about each? Not sure. I’m hoping to expand my reading, publishers I might not be familiar with, and have some fun. Hopefully, if you are on the quest with me, you’ll get something out of a few of these posts as well. I’ll move from left to right, top row then bottom row. Die Kitty Die: I Love You to Death from Chapterhouse/Astro Comics: classic/mod looking comic. I really don’t know what’s going on here, but the characters feel out of an old comic, and there are a good mix of classic monster-type beings popping in and out. I do not know who Kitty is…maybe she’s a cult hero? Maybe not? These comics are not doing a good job of front-loading information. World’s Greatest Cartoonists from Fantagraphics: this issue from Fantagraphics brings us ten mini-comics, many from upcoming graphic novels. Some are straightforward, some are not, but what’s good about this issue, that most of these other publishers can learn is that they introduce Free Comic Book Day, each of the titles, and each of the authors. Brilliant idea! Thank you, Fantagraphics. I will add that these shorts are a bit esoteric, so polish off that palate, and dig it. I’m pre-ordering at least two of these books tomorrow! This is my favorite of Day 4. Doctor Who from Titan Comics: I’m not a fan of Doctor Who. I think the show is hokey, and low budget sci-fi is not my thing; however, I think the comic book is the vehicle for me to enjoy Doctor Who. This issue contains three short stories. I do not know the characters, but I sort of follow what’s going on, and I dig it. Shadow Roads from Oni Press: in this sea of random comics, I never know what I’m going to get. I’ve divided the books up into seven piles, and each day, grab a random one. And I’ll admit, many of the “just OK” books come from publishers that are lesser known or developing. I have no idea what Shadow Roads is, but when I saw the Oni Press logo in the corner, I knew I was in good hands. I’m not bashing indie publishers; I’m just making the case that there are reasons to establish a reputation, and I’m rooting for the little guys and girls! Shadow Roads is a cool Western/Fantasy book with lots of interesting characters with mad weapon skills. I won’t say much more because I’m writing a lot today! Miraculous: Adventures of Ladybug & Cat Noir from Action Lab: Action Lab puts out some great comics for kids, and this seems to be one. Large panels and loud colors mixed with a few life lessons makes this issue a great one for younger (possibly new) comics readers. The Ghost In The Shell: Global Neural Network from Kodansha Comics: don’t know much about Ghost In The Shell, but this action-filled issue looks cool and held my interest through the first 75%, then…not going to lie…fatigue of reading 7-8 issues a day is setting in. I’m not saying it’s a bad thing. You will really know what I get into and what I don’t over the last three days of this week. I will not be shy. I am tired. Lady Mechanika from Benitez Productions: page one – overly tiny waisted hero with exposed hipbones and massive breasts with cleavage popping out of a strange steam-punk outfit. The art looks good, but no one has those proportions. Lady Mechanika is trying too hard. See Ghost In The Shell blurb above.